A very enjoyable day was had by all on Sunday, playing in the Ib Thulin Rotorua handicap tournament, for club members only. The event was won comfortably by our UK imports Chris and Angela Overton, with Neil and Mary Dravitski winning the raw competition. Neil and Mary were second on handicap with Margie Robbie and Marie Milsum coming third. Well done to all placegetters! A huge thanks to James Twist from Craig Investment Partners for their ongoing sponsorship. 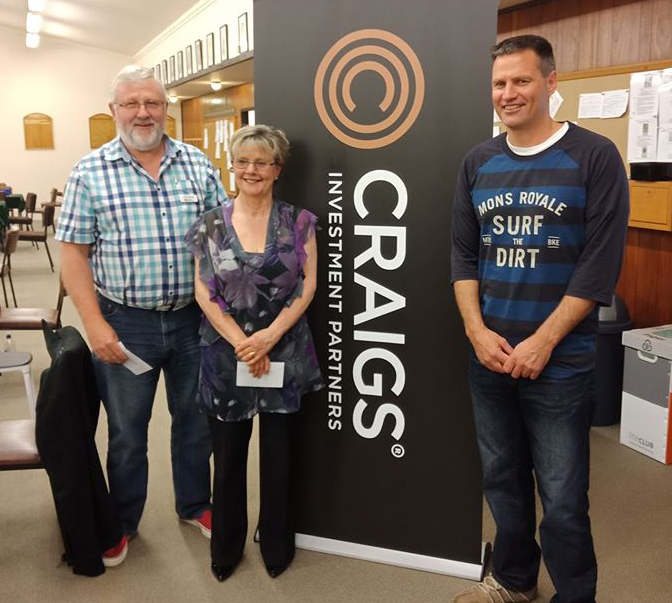 Winners Chris and Angela Overton with James Twist from Craigs Investment Partners. 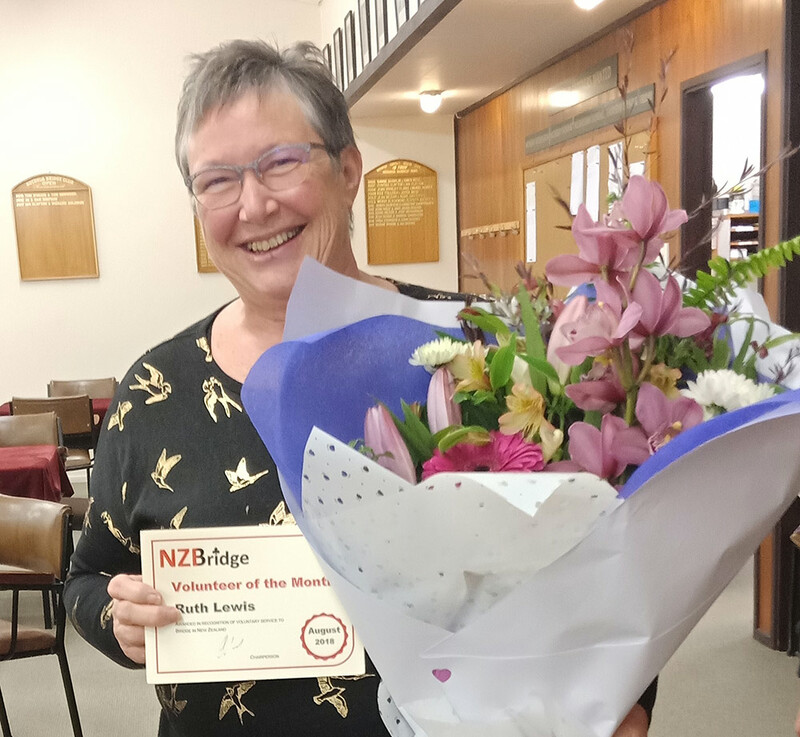 Congratulations to Ruth Lewis, who has very deservedly been named as NZ Bridge’s Volunteer of the Month for August 2018. Ruth has been a member of the Rotorua Bridge Club for well over thirty years. During that time she was on the committee for nearly thirty years including two terms as President, has directed Wednesday night bridge and took the beginners’ lessons for ten years. Ruth is probably best known throughout the North Island as the organiser of Rotorua Bridge Club’s Christmas tournament which had been extraordinarily popular for seventeen years. With her band of elves, they create a Christmas extravaganza which includes the finest Christmas quilts, glorious decorations, a delicious Christmas dinner and generous prizes. There is often a waiting list to fill the 39 tables available for players of all grades. However, her quiet commitment to dealing boards for all the events at the club is remarkable. Week in week out, for approximately 14 years the boards are ready for each session regardless of whether Ruth is away on holiday or has family commitments. It is people like Ruth Lewis who ensure a club functions well and has events of which we can be proud, so it is great that the club can show her some recognition in this way.